New Year's party hat and streamers. Packed bars, busy dance floors and wild clubs are great New Year's Eve destinations -- if you're single. If you want a more romantic New Year's celebration with your boyfriend, seek out more intimate activities. Pick locations with natural beauty, activities that bring you closer together or places that have personal significance to both of you. If you feel the itch to get out of town, schedule a romantic getaway over New Year's Eve. A cute bed and breakfast or a quaint hotel make the perfect place to share a kiss at midnight. Pick a spot with nice scenery to make the trip itself extra special and make a mix of all of his favorite music for the car ride over. If you're short on time or don't want to pay for multiple nights at a hotel, pick a place nearby and make it a "staycation" trip. Entertainment on New Year's Eve isn't limited to drinking in crowded bars. To celebrate more intimately, buy tickets for a local New Year's performance. Check what's playing at local theaters, sports venues and music spots to find an event that you'll both enjoy. If you're short on funds, movie theaters can be a less expensive option. Look for a midnight showing at a theater that plays classic films as a way to celebrate New Year's Eve. If you want a romantic evening and also feel good about what you're doing, check out your favorite nonprofit's event page. 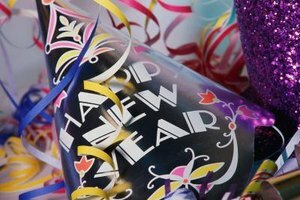 Many charitable organizations throw New Years events and parties with all benefits supporting the nonprofit's charitable cause. Often times these events are held at museums, so you'll have entertainment as you peruse a cool venue and ring in the New Year. Ticket costs for events with a full dinner and open bar can get pricey, but many organizations host events with light appetizers and limited drinks that are more affordable. Exploring your own city on New Year's can make for a nostalgic adventure. Go back to the spot of your first date for lunch or dinner to reflect on how far your relationship has come. Plan in stops at your favorite museums, bars, stores and attractions. Watch the ball drop at a place that has significance to both of you, like the place you first introduced him to your friends or where he first told you he loved you.